Don’t miss out on potential customers! 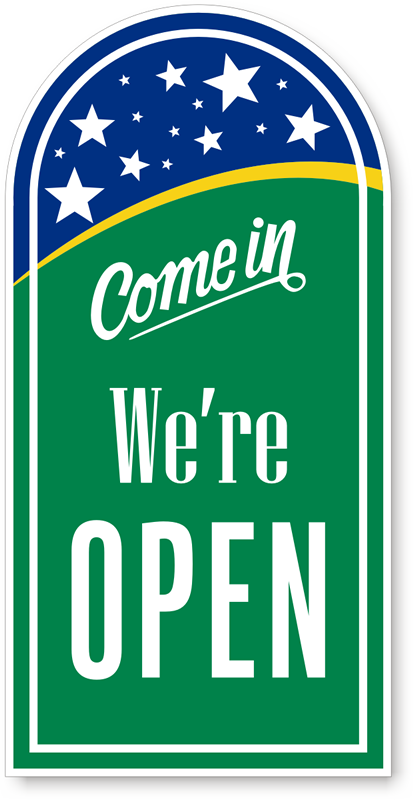 Use this 'Come In - We’re Open' sign to let your customers and visitors know your facility is open. • Sign is bright and draws attention instantly. • Rounded top increases visibility. • 160 mil thick corrugated polypropylene plastic is tougher than corrugated fiberboard, yet lighter and easier to handle than extruded plastic sheeting. • Printed on high resolution digital ink jet equipment, graphics, logos and tints are reproduced faithfully. • Durable enough to resist extended outdoor exposure, signs are also resistant to most household chemicals.